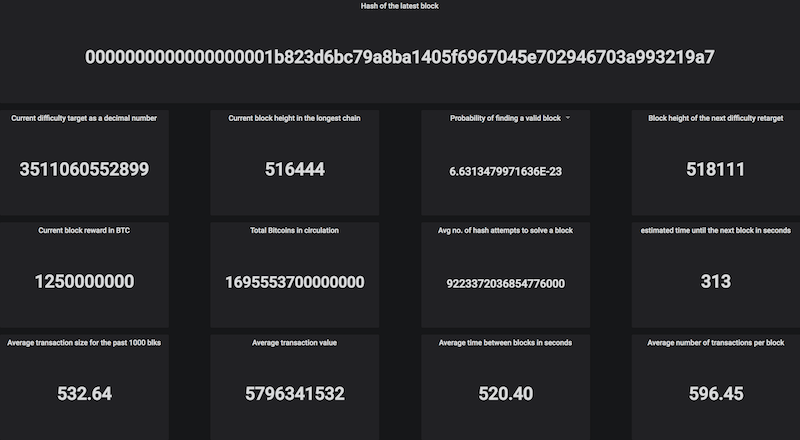 I wanted to get a few BitCoin BlockChain Stats to show on a Grafana Dashboard without having to install and run a whole bunch of code. Luckily blockchain.info provide a simple REST web interface for this. The next step was to get the data needed from blockchain.info. A simple PHP script was used to get this data, format it and use the Zabbix Sender (zabbix_sender) to post it into a Zabbix Server. I organised the Zabbix data using a single Zabbix host with a few Zabbix items (which must be created as "Zabbix trapper" item type) to hold the data. The PHP script is run on a Zabbix Server (just for convenience really) under cron every 60 seconds. Finally I created a simple Grafana Dashboard using "Single Value" panels to show the data. 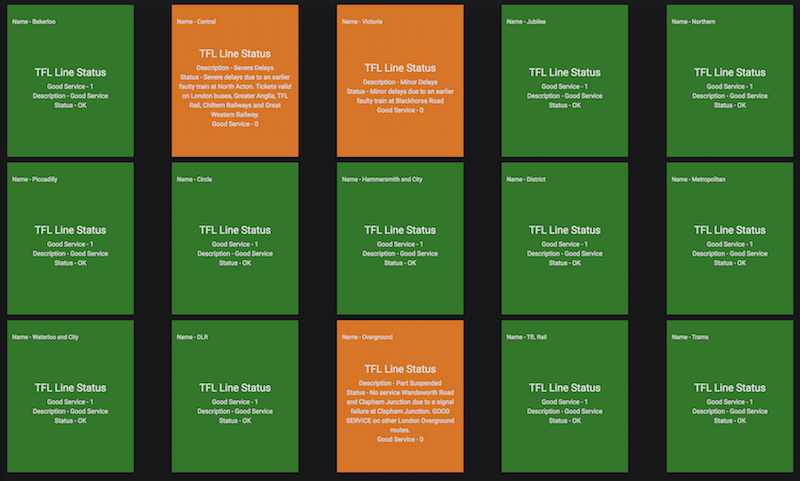 Transport for London (TFL) publishes a lot of Open Data for Public consumption about the status of the London Underground, in real time. This data is updated every 30 seconds in XML format and is mostly documented. As a proof of concept I wanted to setup InfluxDB to hold the status of the Underground Stations and present the results on a Grafana Dashboard. The first step was getting hold of the XML data. Unfortunately the SDK does not say what the Domain is to get the XML from. A little Googling allowed me to find the XML I needed here. The next step was to extract the data needed from the XML. I wanted to get the name of the TFL Underground Station, It's status and a description of any issues. A simple PHP script was used to get this data, format it and use an Influx file import to add the data to an Influx Database. The PHP script is runs under cron every 60 seconds. Finally I created a simple Grafana Dashboard using "Table Panel" panels to show the data. As a proof of concept I wanted to setup Zabbix to monitor the status of the Underground Lines and present the results on a Grafana Dashboard. The next step was to extract the data needed from the XML. I wanted to get the name of the TFL Underground Line, It's status and a description of any issues. A simple PHP script was used to get this data, format it and use the Zabbix Sender (zabbix_sender) to post it into a Zabbix Server. I organised the Zabbix data using a Zabbix host for each one of the Lines with a few Zabbix items (which must be created as "Zabbix trapper" item type) to hold the data. The PHP script is run on a Zabbix Server (just for convenience really) under cron every 60 seconds. Finally I created a simple Grafana Dashboard using "Status Panel" panels to show the data. Are Ubiquiti actively blocking installation of Third Party Firmware?